HIDALGO, TEXAS--WBO interim featherweight champion Juan Manuel Marquez bucked a tough and spirited challenge by Filipino Jimrex Jaca, stopping the latter in the ninth round following a big left in their scheduled 12-rounder. Marquez was cut over his right eye, and blood kept oozing profusely as Jaca tried to take advantage of the cut. 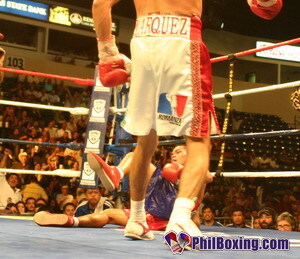 However, a big Marquez left sent the Filipino for the full count at the 2:48 mark, allowing Marquez to retain his title. Jimrex Jaca (left) staggers Juan Manuel Marquez in the second round. "Jaca showed tonight that he is such a durable fighter, and someone who has a great promise as a young fighter. He gave Marquez a great fight, and HBO was happy with Jaca's performance," said promoter Oscar De la Hoya. 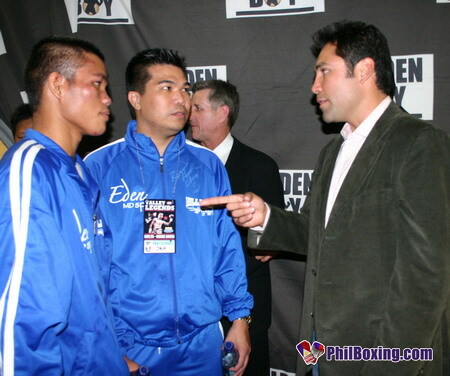 Golden Boy Promotions CEO Oscar de la Hoya talks to Jimrex Jaca after the fight. Caption of top photo: Jimrex Jaca falls on the canvas after being hit by Juan Manuel Marquez in the 9th round. Jaca fails to beat the count. All Photos by Dong Secuya.